Stacy Tilton Reviews: Whose ready for snack time? Whose ready for snack time? Okay so maybe the title of my post is kind of a silly question. I mean who isn't ready for snack time? I know I am pretty much all the time. Except maybe right after a meal..then maybe I need a bit to be ready. But other than that I'm always up for a snack. And since I'm trying to make a good effort at losing some weight I gained last year I'm working hard at making better snack choices since I like to snack so much. One of those choices recently I found I like a lot is Farmers Pantry Meal Snacks. They are actually made with real meat and veggies so it's a snack I don't have to feel guilty about having. Inside a single package (with a center divider) you have your meat and your veggies. Once you tear open the package you pull apart the center seal to mix your snack and then it's ready for none other than...Snack Time! I love the combination of the meat pieces along with the crunchy veggies. It gives you a great flavor combination. Only downfall for me is the package is not resealable and it contains more than one serving...that means I have to be smart about how much I eat at once, otherwise it's not really a healthy snack after-all. Another great snack from Farmer's Pantry is their Cornbread Crisps that are baked with real cornbread. I'm a big fan of cornbread so trying these was not a problem for me. The honey-butter I have to say is soooo good, I wanted to run out and get more after I had a small sample bag of them. And after my husband tried the jalapeno ones I put in his lunch he was texting me saying how good they were and wanted to know if I had anymore of them. Guess we both found us a new snack...and they are so much better for you than potato chips! Farmer's Pantry Meal Snacks: The first ever snack that combines meat and veggies in one package is a revolutionary new snack created to fill the needs of today’s “on the go” busy Americans. Each Farmer's Pantry Meal Snack is like a complete hearty meal, slow-roasted into a crunchy snack. The recipes start with ingredients sourced from family farms across America. The snacks are seasoned, with a slow-roast for the meat and vegetables; then, they are gently blended over low heat. Finally, before all the goodness has a chance to escape, they immediately seal it in the dual-pouch package until you tear it open and enjoy. Farmer’s Pantry Meal Snacks have a suggested retail price of $5.99, in a 2.5 oz bags. Farmer's Pantry Cornbread Crisps: These crispy delights are like no other on the market: made from one of the oldest and most popular American food staples – freshly-baked cornbread. Farmer’s Pantry Cornbread crisps are the first of its kind, delicately sliced and toasted to crispy perfection, and created from the wholesome goodness of cornbread you can munch on the go. Farmer’s Pantry Cornbread Crisps, available in Original, Jalapeno and Honey-Butter flavors, are a crispy, savory snack that tastes as mouth-wateringly delicious as the first bite of a slice of corn bread or corn muffin. Made from fresh corn and other whole grains grown on American farms, these crisps are sure to appeal to discriminating snackers across the country. Farmer’s Pantry Cornbread Crisps are approximately $3.99 for 6 oz bags, and under $2.00 for 2 oz bags. 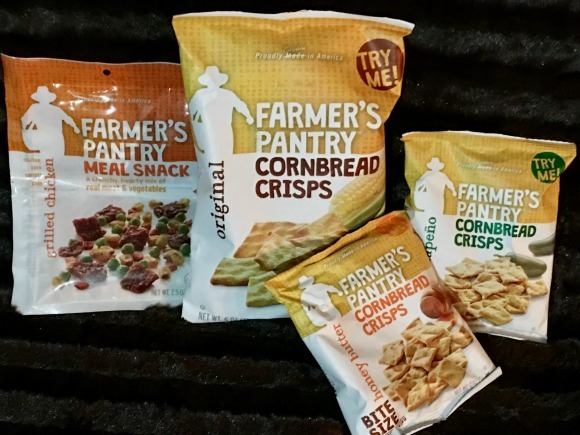 Farmer’s Pantry, the proudly American new snack brand, debuts the first snacks of their kind: 100% American grown first-ever Farmers Pantry Cornbread Crisps and the revolutionary, innovative Farmers Pantry Meal Snacks, a first in offering meat and veggies in one package. Farmer’s Pantry is pushing the boundaries of what it means to be hungry – and to be fed well. Americans are a driven people, always clamoring for new ideas, new things to try and the “best” of our obsession with food. Being hungry and finding satisfaction isn’t just a condition, it’s a cultural lifestyle. I have heard of these & I think the cornbread crisps would taste great. I need to give these a try.